Its the end of 1991, and Western Europe is on the brink of forming a truly unified Europe, one of the greatest diplomatic feats of the century. But this fragile alliance is about to come apart at the seams as key diplomats are suddenly and mysteriously being murdered! Thats when Ralph Dibny, a.k.a. 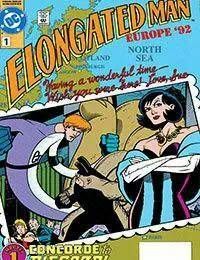 the Elongated Man, enters the picture! Who better than Justice League Europes own Stretchable Sleuth to investigate one of the greatest mysteries of the decade?